Appendix to The Sims 3, which introduces changing seasons and related consequences. Thanks to it, Sims can participate in seasonal festivals and enjoy the attractions offered by summer, autumn, winter and spring. This is The Sims 3 expansion pack. The Sims 3: Seasons is another expansion of the popular life simulator game. The production of The Sims 3 has been prepared by The Sims Studio team which is responsible of the development of the Maxis series. 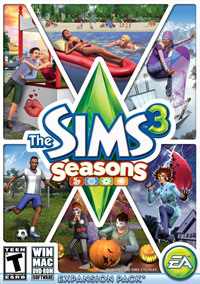 As the name suggests, the expansion focuses on the theme of changing seasons in the Sims world. Each of them determines the moods and desires of the characters and the relations between them. It provides previously unavailable features. Sims can romp around autumn leaves, snowboarding in the winter, let off the fireworks, build an igloo or a walk in the spring rain. There are also new activities such as playing football and holidays. The Sims can celebrate the seasons for example spring festival or Halloween. Besides these attractions, the expansion introduces many new seasonal items, (for example: raincoats, colorful umbrellas, snow suits), decorative objects and food (pumpkin pie, Christmas decorations), the weather effects (rain, snow and the possibility to get tan) and a mysterious visitor (a visitor from outer space). What is more, in a special edition of Seasons there are available different items like: the Ice Club plot and items made of ice (bar, chairs and architectural elements). Game score 8.6 / 10 calculated out of 206 players' votes. Expectations before the premiere: 9.5 / 10 calculated out of 107 players' votes.